Philippine great Manny Pacquiao (left), and American legend Floyd Mayweather Jr. This has been billed as the ‘Fight of the Century’ between two naturally gifted and intelligent fighters, who outside the ring, are like chalk and cheese. First up we have Floyd Mayweather (Junior) who is flash, brash and wants the world to know he is the champion. He has the money to go with it. His love for all things expensive is well documented like his collection of beautiful and flashy sports cars, palatial homes plus a huge entourage who are there for his every need. Floyd certainly has been earning well lately to be more precise on average over $US200 million ($FJ410m) a year which has made him the highest paid athlete on the globe. He has his critics who say he has formed his perfect 47 wins and no losses against handpicked opponents who have never extended him. His fans say he has never really been extended because he is a class above everyone. Next up is Manny Pacquiao, who is the direct opposite of Mayweather. He is a God-fearing Christian who is married to wife Jinkee. They have five children. Pacquiao is also a congressman in his homeland of Philippine. He dedicates his spare time to the poor and underprivileged. After boxing he hopes to enter politics fulltime and make a difference to his nation. His record of 57 wins, five losses and two draws has been made by rumbling with the best of the best. He made his way through eight divisions to become champion in each of them. His critics say he has slowed down and is easy to hit of late because of his number of hard gruelling fights. 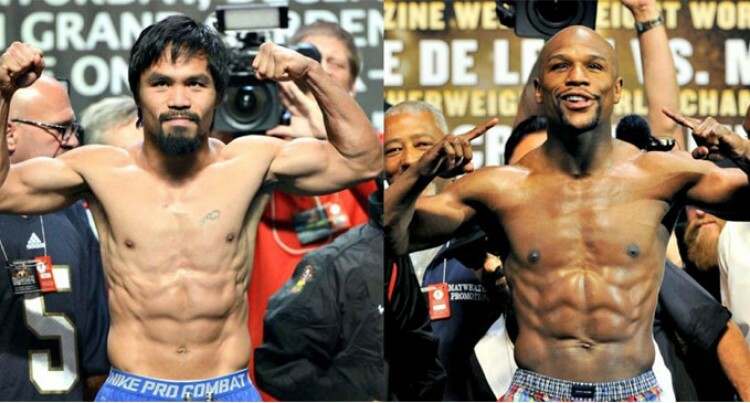 His fans say he is ready and motivated for this clash and you will see the Manny Pacquiao of old. With every great fighter there is usually a great trainer who has guided them to the top. This is also the case for both Mayweather and Pacquiao. Floyd Mayweather (Senior), Floyd’s father is in his son’s corner and brings with him experience at the highest level as a trainer. He knows and can read his son’s mind as the fights get tough. His critics say he is a hindrance in his son’s corner because he could not read a fight well. His fans say what better person to have in the corner than his father who is a respected trainer. In Manny Pacquiao’s corner is celebrated and award winning trainer Freddie Roach who has been training him for years. His critics say that Roach is making his fighter stale by making him train the same way all the time. His fans say you cannot fault the award winning coach as success breeds success. For this one fight each fighter will earn well in excess of $US200m, making it the highest paid boxing bout in history by far. I have been asked countless times who am I cheering and who will win this mega fight. This is a difficult question to answer. I have been to the Wild Card Gym in Los Angeles and met Pacquiao and also spent time with his trainer Roach. I have also met Mayweather and his father in Las Vegas, so I suppose I can make a calculated guess as to who will win. Mayweather as you will see on fight night is a lot bigger than Pacquiao in both height and reach, which will be a major factor in terms of ring generalship. Pacquiao though has a very high work rate and throws blistering fast punches from the southpaw stance in bunches so this can offset Floyd’s physical advantages. Overall, it could be a close fight between these pretty evenly matched foes. My heart says Manny will do it, but my head says Floyd has all the physical advantages and skills for the job. More importantly than that, I hope we get a great fight between these two combatants and as they say, may the best man win.